This dairy site, built mainly by the well known Metcalfe Construction Group, consists of buildings of standard designs adapted to the purpose of the client. 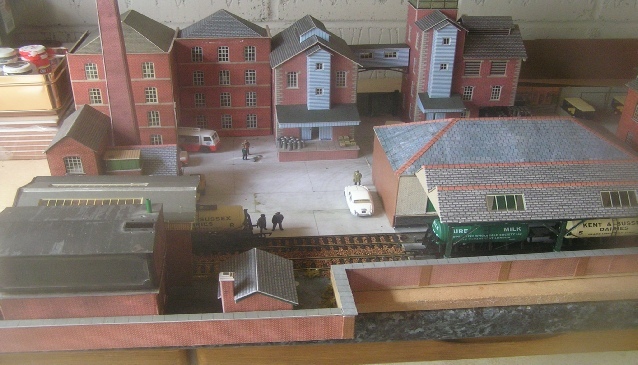 The loading bank and Goods in and out buildings are based on the Brewery design. General assistant, Rodge can be seen on the bank carrying what looks suspiciously like a crate of beer. The Creamery and covered milk loading shed were designed by the architect Lance Scratch (who, since his release from HMP Parkhurst is commonly known as; Free Lance Scratch). Near the raised loading bay between these two buildings Gerry and Ossie are settling their differences over Phyllis (from the nearby allotment site) who awaits the outcome near the steps to the dock. Outside the workshop and battery charging sheds the chief engineer, Al, points out a leak in the roof of that structure to Anthony, the premises manager. In the workshop is mechanic Timmy who is particularly peeved today because it is necessary to remove the entire cab of the Wales & Edwards floats just to adjust the front tyre pressure. The bottling plant, based again on the standard brewery building design, has been adapted to include a churn steam cleaning bay where Mikey is busily engaged in readying the next batch of churns to load into the steamer cabinet. Although he has wellies there is a shortage of aprons. The situation is so bad that Mikey is considering joining the Masons. Meanwhile, driver Bryan is putting cleaned churns onto his vehicle for return to the farms.